They say mom knows best, and when your mom is first lady Michelle Obama, that rings especially true. Wearing a lovely Antonio Berardi dress, FLOTUS is one of Seventeen magazine’s May cover stars (Meghan Trainor graces the other side). She posed alongside two of the luckiest teens ever, whose essays won them a chance chance to interview her for the issue. 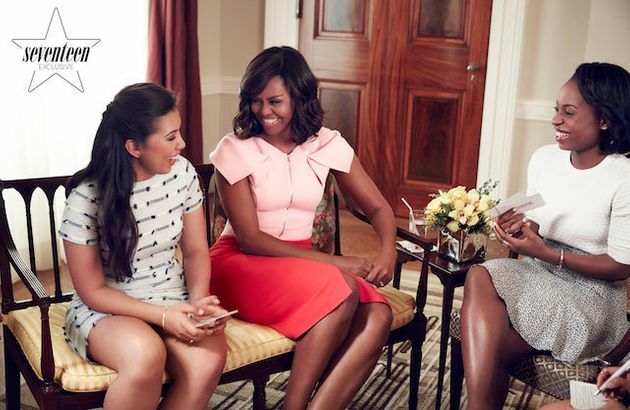 Gemma Busoni and Zaniya Lewis asked the first lady a number of questions, including whether or not she ever thought she’d be first lady and how she let her haters be her motivators, so to speak. Most notably, she shared the great advice she gave to daughters Sasha and Malia about applying to college — timely stuff, as Sasha is set to begin her freshman year this fall. Pretty sound advice from the woman whose commitment to education and empowering young women has been a tentpole of her time in the White House.